WAYS orchestras perform approximately five times a year. Concerts often include individual performances by members and feature notable guest artists. Those able to attend all our concerts across the year have the privilege of witnessing the development of our orchestras. From humble beginnings as newly formed ensembles performing at the JWAYS End of Term Concert, to the heights of the wonderfully proficient string orchestras performing at our End of Year Concert. It is a delightful journey to witness and partake in! The orchestras typically replace half their members each year and take on a new repertoire. 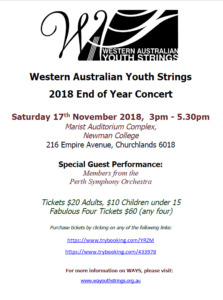 The Mid Year Concert is the first performance for the ‘new’ WAYS and JWAYS orchestras and is particularly exciting for new members. WAYS performs annually at what is now known as the WA Schools’Junior Orchestra Festival and continually achieve exemplary grades. WAYS performs at the Government House Open Day. This is an opportunity for the senior orchestra to play before a public audience in a special environment as guests of the Governor of Western Australia. Unfortunately due to ongoing extensive renovations at Government House, the Open Day will not proceed in 2018. We look forward to returning in 2019! Both orchestras may be invited to perform in the main public area of the shopping centre on a weekend in Term 3 and immediately prior to Christmas. This is a good opportunity to engage with the public and attract new members from our local area. Private performance for residents of the Aged Care Facilities. The date is likely to be Wednesday, 12th December 2018 in lieu of normal rehearsals. The End of Year Concert is a fun event which enables WAYS and JWAYS members to showcase their full achievements and celebrate the performances of members ‘graduating’ from WAYS. This concert is held at Marist Auditorium Complex, Newman College. Until 2016 WAYS had been invited to perform with the Carols Orchestra at Supreme Court Gardens for the Carols by Candlelight. The future involvement of WAYS is uncertain at this time.